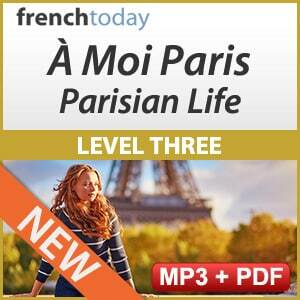 Introducing a brand new low intermediate audio method based on the same characters from the À Moi Paris series. It’s recorded at 2 different speeds (a little slower one and a street French version) and also features an extensive study guide as well plenty of grammar/vocabulary exercises. It’s more than 9 hours of audio and an accompanying PDF document of 182 pages. It covers all kinds of real world situations including: describing and comparing people and things, setting an appointment in French, going to the gym, making various kinds of phone calls, getting ready for a party, ordering and commenting on food and lots more. As usual, the product is available for purchase individually or along with other audiobooks in cost-saving bundles. And like every single one of our products, it comes with a 120 days 100% money-back guarantee. To see our other audiobooks, please click here.